1. In a resealable plastic bag, combine the pineapple juice, garlic, soy sauce, ginger and oil; season with salt and pepper. Add the pork and scallions and marinate at room temperature for 30 minutes. 2. Preheat an outdoor grill or grill pan to medium-high. In a medium saucepan, bring 1 3/4 cups salted water to a boil. Add the rice, cover and cook over low heat for 18 minutes. 3. Meanwhile, thread the marinated pork and two-thirds of the pineapple chunks onto four 10-inch skewers and the marinated scallions onto one 10-inch skewer. Grill the kebabs, turning occasionally, until golden brown and cooked through, at least for 10 to 12 minutes. 4. Coarsely chop the remaining pineapple chunks and stir into the cooked rice. Remove the grilled scallions from the skewer and stir into the rice. 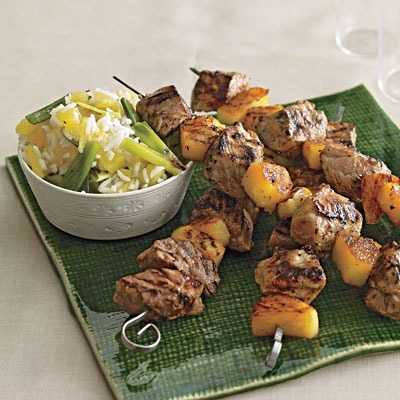 Serve the pork kebabs with the pineapple-scallion rice.